We find our clients’ needs are endlessly varied, so we designed our Las Vegas convention, meeting and event facilities to be the same way. Whether you desire an intimate or large-scale setting, our dedicated team and large range of services will accommodate your event needs. For information call (888) 987-8786. Large-scale entertaining made carefree. 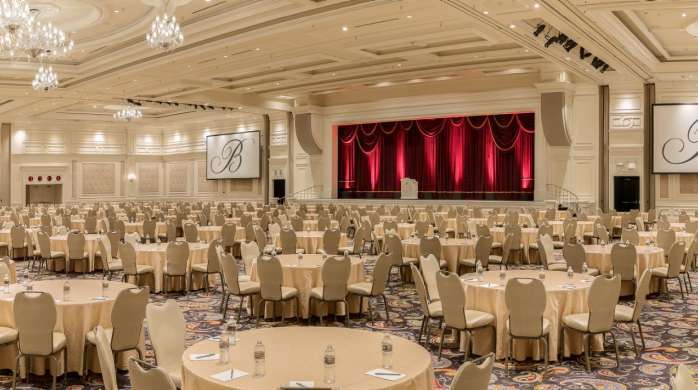 Enjoy 45,000 square feet of customized space capable of facilitating theatre-style gatherings of more than 4,500 or banquets in rounds of 10 seating up to 3,000. More options abound with nine individual rooms ideal for breakout sessions. 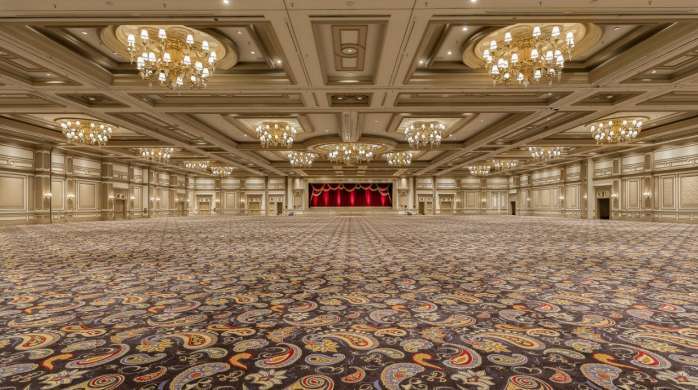 Our largest venue, the Grand Ballroom offers 45,000 square feet of magnificent space. Enjoy the versatility of either a vast or more intimate ballroom setting. The Tower Ballroom was beautifully designed to host galas, balls, and large conferences. Built-in staging provides an ideal scene for any form of entertainment. 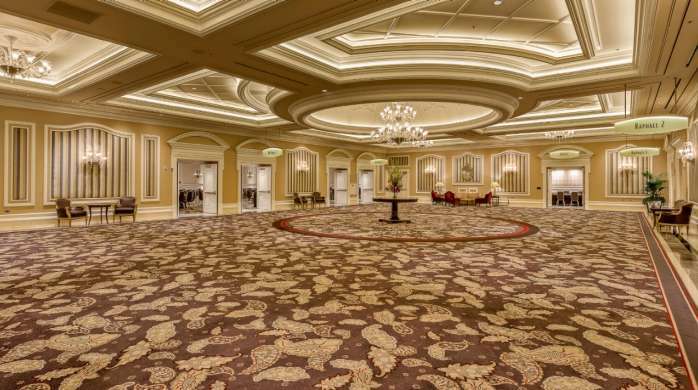 Our 30,000 square-foot Tower Ballroom offers a combination of ballrooms in varied sizes. Configurations up to 21,824 sq. 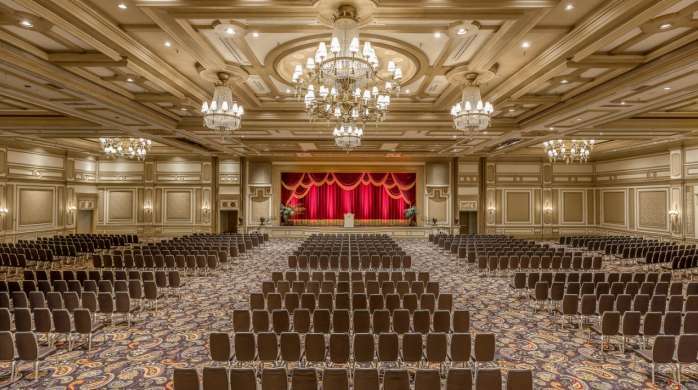 ft.
Grandiose in stature, our Bellagio Ballroom is ideal for galas, balls and large conferences. Your options for enjoying this incredibly spacious venue abound from large formal dinners, shows, training classes, business presentations, and receptions to theatre-style gatherings for 2,000 and banquets in rounds for 1,400-plus guests. 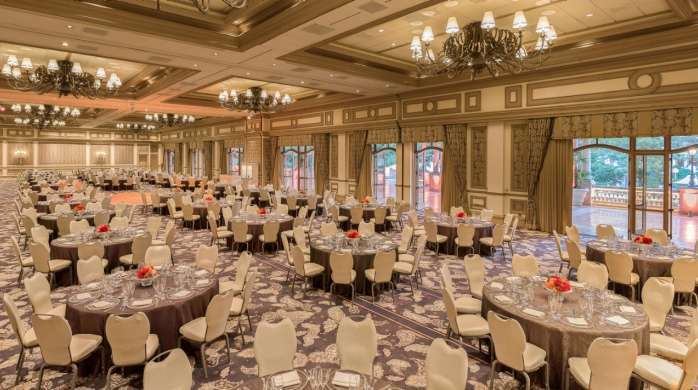 With 22,000 square feet of AAA Five Diamond Award-winning space, the Bellagio Ballroom lives up to its namesake. Spaces to take your breath away... The Monet Rooms are simply exquisite. 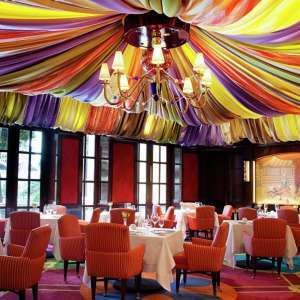 Astound your guests with a distinctive experience capturing the essence of Bellagio's beauty. Four captivating rooms opening onto a sweeping patio, overlooking our Mediterranean-style Pools & Courtyards, are available for your ultimate enjoyment. Truly unparalleled settings for indoor/outdoor affairs. Up to 9,570 sq. ft. of space. Celebrate the art of meeting in our inspiring Renaissance event space. 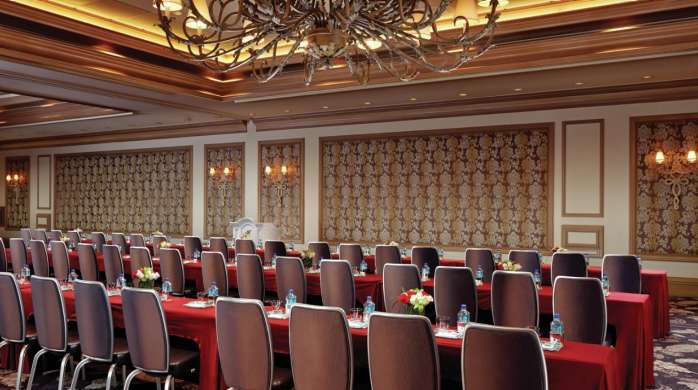 This lavish collection of meeting rooms and ballrooms are robust in form and function. Picture-perfect Michelangelo design offers tranquil views of the pool and courtyards. Renaissance Foyer offer an impressive gathering foyer and private set up room. 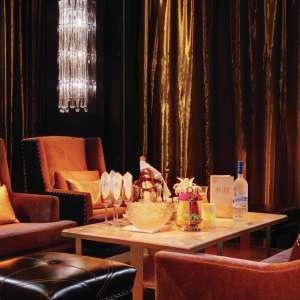 Our Las Vegas hotel's Renaissance revives the modern-day meeting with artistic flair and creativity. Up to 7,228 sq. ft. of space. This unique collection of intimate meeting spaces pay homage to some of the world's finest artists. Modern accompaniments such as custom lighting, a Barco projection system, drop-down screens, an electronic power panel, and the latest in audiovisual equipment are available for your convenience. Impressive in ambience, intimate in its setting. Up to 3,740 sq. ft. of space. Rendezvous in the enchanting outdoor ambience of our Grand Patio. Simply unrivaled in its style and location, it’s ideal for wedding receptions, cocktail parties, formal or informal dinners, and more… Enjoy captivating views of our Pools & Courtyards. A grand destination for outdoor entertaining graced with views of our Pools & Courtyards. 6,082 sq. ft. of outdoor space. Revel in the fine art of cooking and entertaining. Our Tuscany Kitchen ® – the first exhibition kitchen of its kind in Las Vegas – invites you to learn culinary secrets from Bellagio's award-winning chefs, as well as the intricacies of wine pairings selected by our master sommeliers. 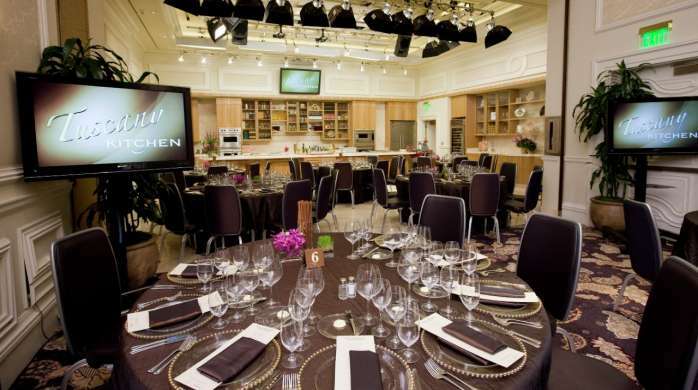 Designed specifically for meeting and convention groups, this creative venue is masterfully equipped for cooking demonstrations and receptions, formal dinners and tastings, team-building activities, spouse activities, cocktail receptions, and more. For your planning ease, Tuscany Kitchen offers flexible packages and customized experiences. The first exhibition kitchen of its kind in Las Vegas invites you to be a part of Bellagio's rich culinary tradition. 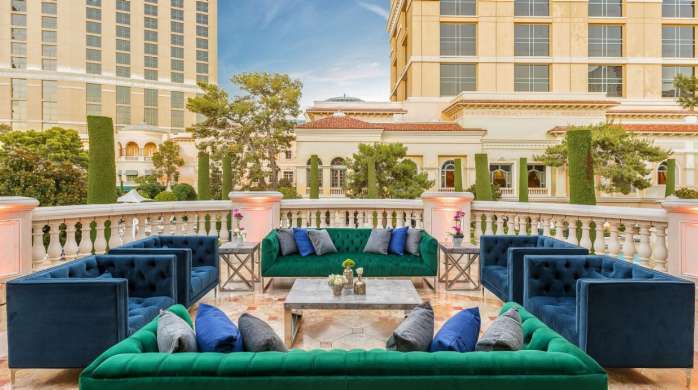 Let our unrivaled variety of fine outlets, ranging from AAA Five Diamond restaurants to ultra lounges and the Bellagio Gallery of Fine Art, complement your event experience with distinction and superior service.